This is by far my most popular design to date. I think the simplicity coupled with the versatility make it so appealing. The versatility being for a larger collar and a shorter vest wear with the longer side up and for a smaller collar and longer vest wear with the shorter side up. This takes @2.5 skeins of Cascade Magnum. A Ravelry pal of mine Ronda of Main St Yarn Shop told me her mom just used 2 skeins when making one. 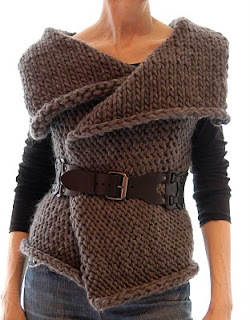 The 3rd would be used towards reinforcing the armholes. Or you could scale back the size and use the extra for the armholes. One size fits all though you can use the schematic in the pattern to easily make adjustments. Hi, sure it's color #9465.
i love this pattern and just bought it. i cannot seem to find the magnum super chunky. i can only find the magnum chunky which recommends u.s. 15-17 needles. help! i need guidance. thanks so much. Hi Sara, the Magnum you found is the right one :) the ball band suggests US 15-17 but I found a US 19 works better (though if you knit loosely you'll want to use a US 17, check your gauge to make sure), if this yarn is worked too tightly it creates too dense of a fabric. Hope this helps! Do you know if I can get this yarn in Australia? Thanks, Lyn. Your description should be corrected for grammar and clarity. "The versatility being for a larger collar and a shorter vest wear with the longer side up and for a smaller collar and longer vest wear with the shorter side up." What color yarn is your sample? 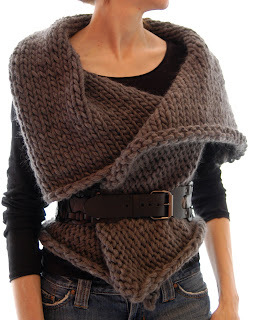 I want to make this for my 23 yo daughter and I know she would love that color. Thanks a bunch! I looked by couldn't find it, but there is a store not to far from where I live that sells this yarn, so I'm going to go in and see what I can find that is a neutral. My 22 year old is going to love this! Thank you so much for your help! Magnum comes in a great variety of neutrals, I'm sure you'll find one your daughter will love! :D Enjoy! I wondered if I could make it a bit longer. I also wonder if I need to reinforce the armholes. Hello! This might sound strange, but I'm wondering if you could create a pattern from this that could be used to sew something with fabric (as opposed to a knitting pattern). Bonjour est ce que c'est en français aussi? Bonjour, oui! C'est en français aussi! You will receive the French version when you purchase the pattern. If not let me know.